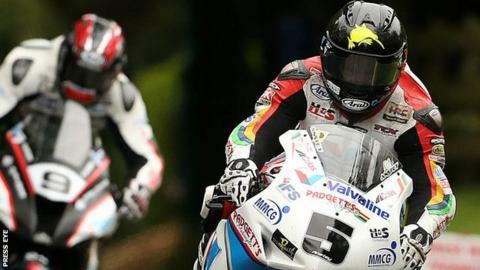 New Zealand's Bruce Anstey was declared winner of a controversial Superbike race at the Ulster Grand Prix. But the day's racing was marred by a fatal accident during the second Supersport race at the Dundrod circuit. The name of the killed rider was not revealed but event organisers said his family had asked that the remainder of the event continue as planned. Fermanagh's Lee Johnston won three races but victory in the curtailed feature event went to Anstey. With the race being stopped before the seventh and final lap because of an accident on the 7.4-mile road circuit, the organisers decided the standings at the end of the fourth lap should count as the result. There had been some dispute over the decision to give the victory to Anstey. Runner-up Ian Hutchinson, who had been leading at the end of the fifth lap, felt he had been hard done by. "I genuinely feel like I won the race," said the Yorkshire man, 35. "It could not go back to lap four because that is not two-thirds distance. "I planned my race to be leading at the first point where a result could be declared in the event of the race being stopped." The race organisers indicated they could not take the standings after the fifth lap because some riders had not completed it when the red flags went up. Anstey's victory came two days after he had won the Superbike race at the Dundrod 150. In the rest of Saturday's programme, Lee Johnston won three of the other six races. The 26-year-old from Maguiresbridge landed his maiden UGP victory in the opening Superstock event, beating early race leader Peter Hickman. Johnston, on an East Coast Racing BMW, beat Ian Hutchinson's 2010 lap record by posting an average of 132.793mph on his final circuit. He then beat William Dunlop after a thrilling duel in the Supersport event. Riding a Triumph machine, Johnston achieved another lap record with an average speed of 128.913mph. Dunlop had to be content with his 12th Ulster GP podium while British Supersport star Glenn Irwin finished in third place. "It was a great battle with William. He is a big name in the sport so I suppose it shows how far we have come in the last few years," said Johnston, now based in Great Hatfield near Hull. Johnston later won a curtailed Supersport Race Two, heading the standings after three laps, with Irwin in second place and Hutchinson third. Peter Hickman led from start to finish to win the second Superbike race. The Isle of Man's Conor Cummins snatched second place ahead of Michael Dunlop after a late charge. Cullybackey's Sam Wilson won the lightweight race, with Neil Kernohan in second place. The Supertwins race was won by Mullingar rider Derek McGee.